Tatu-derm® was created in 2005 when our inked inventor Rusty, woke up with his back stuck to the sheets after getting a new tattoo. He was angry with the lack of protection his tattoo artist had to offer and this fueled his creative process. He began researching moist wound management and started testing ideas on himself and a few tattoo artist friends. The idea took off, he filed patents, trademarks and started our company TatuYou. Caring for a new tattoo doesn't have to be messy, painful or time consuming. Using Tatu-Derm®, you can change your tattoo aftercare regimen to see optimal results. When using Tatu-Derm® you eliminate the repeated cleansing and moisturizing allowing you to go about your daily routine immediately after getting your new tattoo. 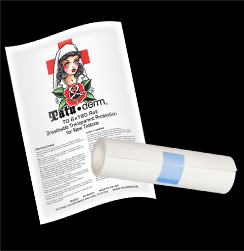 Tatu-Derm® is a transparent, sterile bandage for new tattoos, manufactured in the USA. 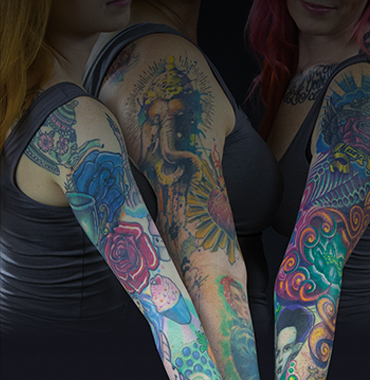 Tatu-Derm® eliminates the need to take excessive precautions with new tattoos and takes the confusion out of understanding how to take care of your new tattoo for optimal results. Using the same breathable thin film technology used by healthcare professionals for decades, Tatu-Derm® eliminates the need for multiple daily washings and provides a comfortable layer of protection from dirt, bacteria, abrasion and water while keeping skin hydrated. 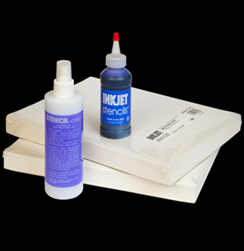 The thin film contains no active ingredients, provides flexible coverage that conforms to most body parts, and the medical grade adhesive sticks only to dry skin, allowing the open skin on the new tattoo to breathe. Because Tatu-Derm® acts like a second layer of skin, tattoos are able remain clean and protected while the film is in place. This means no more scabbing and more brilliant colors. 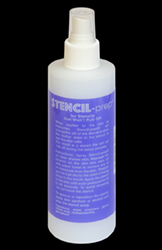 When applied as instructed Tatu-Derm® will protect a new tattoo for days, containing all body fluid and keeping the tattoo protected.